The Diversity Leadership Conference is the fastest growing diversity conference in Texas & an outstanding student-led event designed to address diversity and leadership issues and their application in student development, higher education, and the global society. 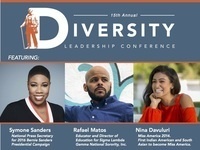 The 15th Annual Diversity Leadership Conference will be held on February 15 & 16, 2019 in the Lowman Student Center at Sam Houston State University. Register TODAY!